Clean with soft, non-abrasive cloths, pH-neutral cleaning solutions, and either warm or hot water. Periodically, have countertops professionally re-sealed. Marble. Popular but exceptionally porous, marble hates being left wet. It also strongly dislikes abrasives and acids, so avoid using any vinegar- or lemon-juice based DIY solutions. 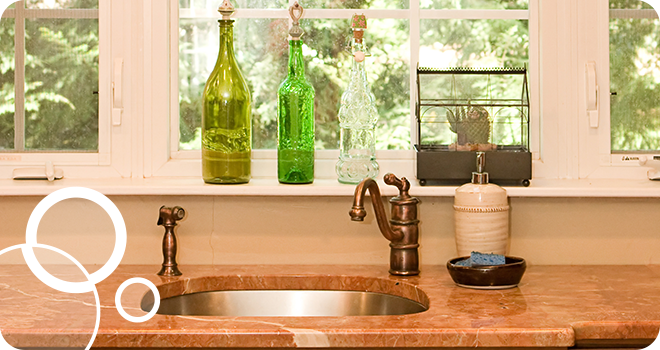 Best bet for marble: clean with a pH-neutral soap and hot water, then dry thoroughly with a soft absorbent cloth. Granite. Compared to marble, granite is less peevish about water, but still should never be left wet. For tough stains, a mildly alkaline paste of baking soda and water can be used, but with extreme caution. Gently wipe versus scrubbing away the paste as baking soda is also mildly abrasive. Laminate. While less expensive to replace than marble or granite, laminates can be just as prone to staining from neglected spills and to long-term damage from abrasive sponges and cleaners. What’s more, laminates are typically held together with adhesives, which break down with exposure to water, so be sure to dry thoroughly especially around seams. Ceramic (tile). Ceramic tile counters may look beautiful, but their grout is particularly sensitive to staining and can also harbor and grow mildew, mold, and germs. If ceramic tiles are sealed (most are), they can be cleaned effectively with hot water and pH-neutral cleaners. The grout, however, should be routinely deep-cleaned—typically using a bleach-based solution and small nylon-bristled brush—both to sanitize and treat stains. Copper. Most people who invest in copper countertops do so knowing the red metal will change its look over time, taking on various hues of darker reds, browns, and blue-green verdigris (think, Statue of Liberty) as it oxidizes with exposure to air and reacts chemically with the acids found in foods. To slow the natural aging process, copper can be sealed and/or lightly waxed. Stainless steel. Though more likely to be found in restaurants than home kitchens, stainless is probably the least sensitive of countertop materials and can even withstand a bit of mild abrasion to remove stains and caked-on substances, though abrasives will dull its shine over time. Stainless is also more prone to showing fingerprints, smears, and water stains. For everyday cleaning, hot water and mild cleaners work just fine, though solutions formulated specifically for stainless may be preferred on occasion to restore the metal’s natural shine. Let our PROs help maintain the health of your countertops (and the rest of your home). Get your home cleaning estimate today!